Below is a guest post from TEDxBoise 2018 speaker, Brooke Linville. In it she shares what the TEDxBoise experience was like from a speaker’s perspective. If you’ve got an idea worth spreading, be sure to submit your application to speak at our 2019 event; the application link closes at 11:59pm on September 28th. 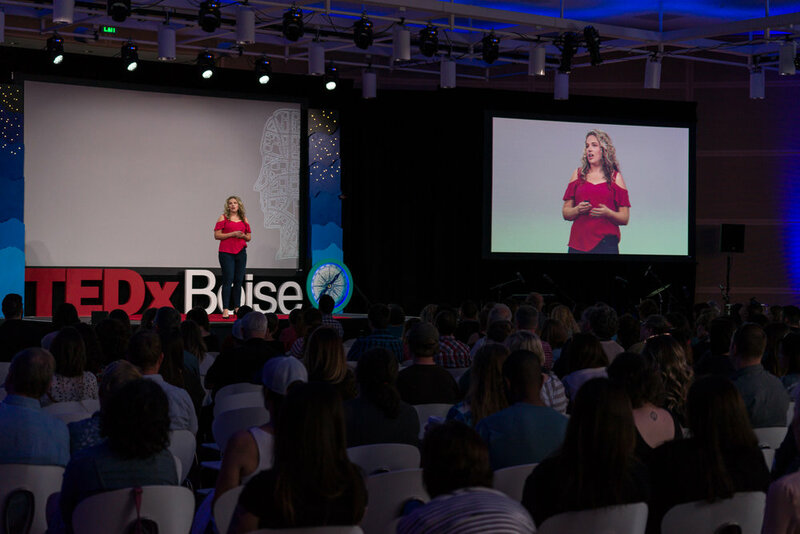 Giving a talk at TEDxBoise last May was one of the most incredible experiences of my life—and I’ve been invited to Google, snorkeled the reefs in the Bahamas, and helped raise $12 million to save my college. I almost didn’t submit my idea. What if no one wanted to hear about my efforts to save my school? Thanks to some encouragement from my friends, I did it anyway. At the time, it was just an idea, a spark, something that had happened. It wasn’t a talk, not when I pitched it to the TEDxBoise team. But it became one, thanks to the support of my speaker coach who helped guide me along the way. The first time I met with her, I shared a lot about myself and my story, details that wouldn’t make it into any of my TEDxBoise drafts but that I needed to process through to find the nugget of story that would thread its way through my talk. The next time we met, I came back with a first pass of the first five minutes of my talk; it was a draft I was proud of. In addition to the coaching, the TEDxBoise speakers and volunteers became a part of my family. We had monthly get-togethers to discuss elements of the event and also create support and community, which helped calm nerves and generate excitement in the days leading up to the event. These were people I could count on to hold my hand as the anxiety mounted. And the anxiety did mount, which I managed by practicing over and over and over again. One of the great parts of having about five months of lead time is that you not only have the opportunity to refine the talk, but you also have the time to practice with so that the delivery is the best it can be. In some rehearsals with the other speakers, I found out that when I said, “I love As” (as in the letter grade) it sounded like “I love eggs,” which obviously gave a different feel to the talk! I added a graphic to fix the problem. The day of the event was amazing. The team supported the speakers, ensuring that each person gave the best talk they could. I needed time alone, and I got that, practicing my talk one final time in the hallway at JUMP. My coach even sang a few inspiring lyrics with me in the bathroom as I mic’ed up. Do you have an idea worth spreading? What’s a defining moment that made your perspective shift? What ideas do you have that haven’t yet been given their due consideration? What do you wish other people knew more about? Apply to speak at TEDxBoise: the red dot is waiting for you. And the TEDxBoise that will help you get there.